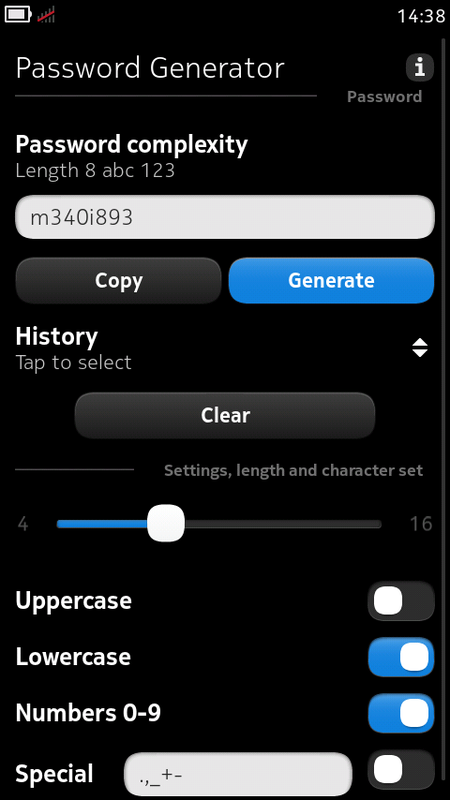 The fixed version of my Password Generator for N9 ('unpublished' since July 2011) is successfully accepted and published again to Ovi Store. If anybody has any question / problem or just a feedback - please write a comment. Localised everywhere. It works in any language - current active for the device is used, more than 24 languages are supported now by N9. True secure random number generator is used. Hardware's one. Localisation - mostly commonly provided for Meego Touch Framework strings are used. System uses the same strings. I am the current maintainer of mssf-qt library package, which is a part of Meego 1.2 Harmattan Security Qt API (more info - Security domain overview). Password Generator uses this library, so briefly for the random data - a request is done, which is transferred to Trusted Execution Environment (TEE) Service - cryptographic and secure one, which generates the needed data. It is not a multiple requests, for example, 8 for 8 characters, but just 1 request. Really secure and truly random. Due to the Nokia switch to Windows Phone - I got an opportunity to become MCPD by my company. Here is my notes about different book as preparation materials on my way to Microsoft Certified Professional Developer (MCPD). So I decided to take a look to the book for previous version of the exam, 70-503 for .NET 3.5. It is really outdated and can be used for preparations for this exam just in case if you really have enough time, a lot of subjects are not covered at all. Professional WCF 4: Windows Communication Foundation with .NET 4. Quite good book to recall some part related to the topic and improve knowledge, but does not cover everything what is needed for the exam. Otherwise the book itself can not be considered as something useful for specialists, it is mostly 'for beginners'. Really useful and "must have" for such exam. Just Entity Framework is described quite briefly. Pro Entity Framework 4.0 (Expert's Voice in .NET). Really nice book about Entity Framework. The author real is a professional and expert. Also "must have", as Entity Framework knowledge is really needed to pass the exam. Some general info. Quite good, but I think - definitely not enough to pass the exam. But I do not know what else might be used here. I am still preparing to this exam, but seems it is a nice book which I would like to use to prepare. I am not sure can I say anything exam content, but I just want to advice - use any available test simulations (at least that which are available on MCTS Self-Paced Training Kit disks), does not matter how strange they are.